As the landlord for several commercial shopping centers, I have come across contentious debates related to exclusivity clauses within lease agreements. Many times, exclusivity provisions are agreed to by the Landlord without proper diligence as to the specific language. This is mostly due to the fact that the future of retail is inherently difficult to predict. New products are born, unimaginable business models emerge, and common brands modify strategies to accommodate dynamic consumer trends and economic growth. A recent example of this has arisen where an existing lease provides the restriction on any other tenant “whose primary business involves the sale of coffee”. While this seems clear enough, what truly constitutes or defines a tenant’s “primary business”? Thirty years ago, and based on the brand name, Dunkin Donuts’ primary business may be interpreted as doughnuts and baked goods. However, a cursory inspection of the company’s reported financial statements clearly indicates that a primary source of its revenue is generated through coffee sales. But what percentage of sales represents the threshold of the firms’ “primary” business. It may be easily argued that "primary" refers to a majority of revenues, above all other streams of revenue. However, if this rationale is applied, should it be applied to the entire Dunkin’ Donuts organization, to the regional franchisee, or to the specific location contemplated within the commercial building? These are just a few of questions which may be raised in an attempt to circumvent the intentions of the lease’s exclusivity provision. In order to add simplicity and clarity to the exclusivity provision, additional language would need to be inserted into the provision, such as a restriction of all future tenants “who advertises its primary business as selling coffee and who sells coffee exclusively for consumption without an accompanying meal”. Additional language such as this would clearly halt the insertion of a Starbucks or Dunkin Donuts, but would not restrict standard restaurants such as Panera or Applebee’s from occupying space within the commercial building. Other prospective tenants such as AMC Movie Theaters and Harris Teeter do have branding associated with coffee so these would be permitted under the restrictive provision. ss markets and prospers from the sale of coffee to its customers. Is this a primary business or an ancillary business of 7-Eleven? Should it matter if the 7-Eleven includes a gas station or if it operates solely as a convenience store? There are many instances where coffee shops co-exist with stores such as 7-Eleven, and as a landlord, I would negotiate terms necessary to allow 7-Eleven to occupy space within the building. They should be permitted to operate under the provision, but written consent by the competing tenant would be advisable prior to the execution of any lease agreement with 7-Eleven. 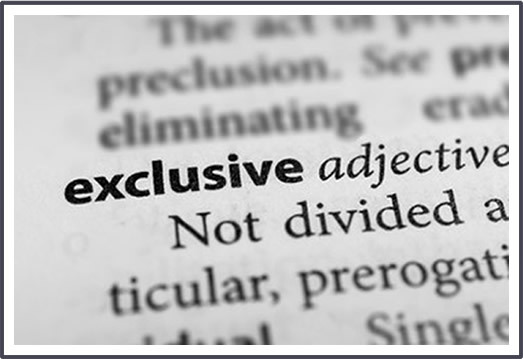 If a landlord accommodates a tenant’s request for an exclusive right to sell provision, it will make all subsequent tenants subject to this restrictive operating provision, which in turn, will undoubtedly give rise to such other subsequent tenants also requesting exclusivity provisions. Each time the pool of potential tenants is diminished, the commercial building becomes harder to lease (and therefore less valuable), which benefits neither landlord nor tenant. In determining how to address a tenant’s request for exclusivity, it is probably most advisable to simply refuse to grant an exclusive right to sell, arguing that the landlord should not be responsible for the tenant’s fear of competition, and in some cases, economies of location may be realized, which may actually benefit the tenant.